Another Win for Gordon & Rees! Judge Finds NM HSD Arbitrary, Capricious, and Not Otherwise in Accordance of Law! And JUSTICE PREVAILS! For those of you who have followed my blog for a while, you understand the injustices that occurred in New Mexico against 15 behavioral health care providers in 2013. For those of you who do not recall, for background, see blog, and blog and blog. These 15 agencies comprised 87% of NM behavioral health care services. And they were all shut down by immediate suspensions of reimbursements on June 23, 2013, collectively. My team (Robert Shaw, Special Counsel, and Todd Yoho, Master Paralegal) and I worked our “behinds off” in these two New Mexico administrative hearings that have so far been held. 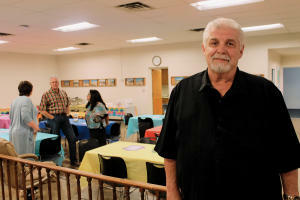 The first was for The Counseling Center (TCC) headed up by Jim Kerlin (seen below). And our decision was finally rendered this past Friday! BTW: It is officially Jim Kerlin day in Otero county, NM, on June 11th. The second hearing, which appeal is still pending, was for Easter Seals El Mirador, headed up by Mark Johnson and Patsy Romero. Both companies are outstanding entities and we have been blessed to work with both. Over the last 20-30 years, both companies have served the New Mexican Medicaid population by providing mental health, developmentally disabled, and substance abuse services to those most in need. After both companies were accused of committing Medicaid fraud, and, while, subsequently, the Attorney General’s office in NM found no indications of fraud, both companies were told that they owed overpayments to HSD. We filed Petitions for Contested Cases. We disagreed. NM HSD based its decision that all 15 behavioral health care companies were guilty of credible allegations of fraud based on an audit conducted by Public Consultant Group (PCG). While I have seen the imperfections of PCG’s auditing skills, in this case, PCG found no credible allegations of fraud. HSD, nonetheless, took it upon itself to discard PCG’s audit and find credible allegations of fraud. These cases were brought in administrative court. For those who do not know, administrative court is a quasi-judicial court, which is specially carved out from our state and federal civil courts. In NC, our Office of Administrative Hearings (OAH) is the administrative court in which health care providers and Medicaid recipients seek relief from adverse agency actions. Similarly, NM also has an administrative court system. The administrative court system is actually a part of the executive branch; the Governor of the State appoints the administrative law judges (ALJs). However, 42 CFR 431.10 mandates that each state designate a single state entity to manage Medicaid. In NM, that single state agency is Human Services Department (HSD); in NC, it is the Department of Health and Human Services (DHHS) (for now). If an ALJ is deciding an issue with Medicaid, then her or she would be substituting his or her judgment for that of the Medicaid agency with respect to the application of policies, rules, and regulations issued by the Medicaid agency. This is why, in NC, prior to 2013, our ALJs could only make a Recommendation, not an Order or Decision. See blog. In 2013, NC was granted a Waiver to the single state agency mandate allowing ALJs to render decisions on behalf of Medicaid. In New Mexico, however, there has been no such Waiver. Thus, the ALJ only recommends a decision. In NC, our ALJs are appointed and are independent of DHHS. Juxtapose, in NM, the ALJ answers to the single state entity AND only issues a recommendation, which the agency may accept or reject. Needless to say, in TCC v. HSD, the ALJ ruled against us. And HSD accepted the recommended decision. We appealed to Superior Court with a Petition for Judicial Review. Judges in Superior Courts are not employed by their single state agencies. I have found, generally, that Superior Court judges truly try to follow the law. (In my opinion, so do ALJs who do not have to answer to the single state agency, like in NC). Special Counsel, Robert Shaw, our paralegal, Todd Yoho, our local counsel Bryan Davis, and I are beyond ecstatic with the result. Robert and I worked weeks upon weeks of 12-16 hour days for this case. I remember the night before the 1st day of trial, local counsel encountered an unexpected printing problem. I had just flown into New Mexico and Robert Shaw was on his way, but his flight was delayed. Robert got to the hotel in Santa Fe at approximately 7 pm New Mexico time, which was 10 pm eastern time. It’s 7:00 pm the evening before the trial…and we have no exhibits. Robert went to the nearby Kinko’s and printed off all the exhibits and organized the binders until 2:00 am, 5:00 am eastern time. During which time I was preparing opening statement, direct examinations, and cross examinations (although I went to bed way before 2:00 am). Regardless, Robert was dressed, clean-shaven, and ready to go the next day at 9:00 am with the exhibits (of which there were approximately 10 bankers’ boxes filled). The trial lasted all week. Every day we would attend trial 9:00-5:00. After each day concluded, our evenings of preparation for the next day began. See the article in The Santa Fe New Mexican. We hope this sets good precedent for Easter Seals El Mirador and the other 13 behavioral health care agencies harmed by HSD’s allegations of fraud in 2013. 42 CFR 455.23 mandates a state to suspend reimbursements for a provider upon “credible allegations of fraud.” Obviously, this is an extreme measure that will undoubtedly put that accused provider out of business without due process. BTW: the “credible” allegation can be non-credible. It does not matter. See blog. 42 CFR 455.23 is the modern day guillotine for health care providers. Which leads me to say…It is my sincere hope, that, going forward, state agencies realize the magnitude of implementing measures mandated by 42 CFR 455.23. Instead of wielding the power willy-nilly, it is imperative to conduct a good faith investigation prior to the accusation. And, certainly, do not conduct an investigation, discard the results, and accuse 87% of your behavioral health care providers in your state. Think of the recipients!! The employees!! And all the families affected!! Posted on October 26, 2015, in "Single State Agency", Accountability, Administrative Law Judge, Administrative Remedies, Alleged Overpayment, Appeal Rights, Behavioral health, CMS, Credible Allegations of Fraud, Criminal Medicaid Fraud, Division of Medical Assistance, Due process, Extrapolations, Federal Law, Fraud, Health Care Providers and Services, Innocent Until Proven Guilty, Judicial Review, Jurisdiction, Knicole Emanuel, Lawsuit, Legal Analysis, Legal Remedies for Medicaid Providers, Media, Medicaid, Medicaid Advocate, Medicaid Appeals, Medicaid Attorney, Medicaid Audits, Medicaid Billing, Medicaid Fraud, Medicaid Providers, Medicaid Recipients, Medicaid Reimbursement, Medicaid Reimbursements, Medicaid Services, Medicare and Medicaid Provider Audits, NC, NC DHHS, New Mexico, North Carolina, OAH, Office of Administrative Hearings, Petitions for Contested Cases, Post-Payment Reviews, Provider Appeals of Adverse Decisions for Medicare and Medicaid, Public Consulting Group, Regulatory Audits, Suspension of Medicaid Payments, Tentative Notices of Overpayment and tagged 42 CFR 431.10, Administrative court, Administrative Law Judge, Audit, Behavioral health, Centers for Medicare and Medicaid Services, CMS, Developmentally disabled, Division of Medical Assistance, DMA, Easter Seals El Mirador, Gordon & Rees, GORDON & REES LLP, Health care, Health care provider, Jim Kerlin, Knicole Emanuel, Mark Johnson, Medicaid, Medicaid Attorney; Medicaid Lawyer; Medicare Attorney Medicare Lawyer, Medicaid Audits, Medicaid recipients, Medicaid Services, Mental health, NC DHHS, New Mexico, New Mexico Behavioral Health Providers, New Mexico behavioral health subcommittee, North Carolina, Office of Administrative Hearings, Patsy Romero, Petition for judicial review, Public Consulting Group, Robert Shaw, Santa Fe New Mexican, Single state agency, Single state entity, Substance abuse, The Counseling Center. Bookmark the permalink. 1 Comment.